The Montebello Police Department reminds drivers and passengers to wear a seat belt. 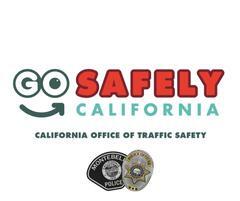 Montebello, Calif.–This Thanksgiving, the Montebello Police Department is joining the California Office of Traffic Safety (OTS) to remind people how important it is to wear a seat belt and the potentially deadly consequences of not buckling up. Thanksgiving is one of the busiest travel times of the year. According to AAA, 48.5 million people will hit the road for the Thanksgiving holiday, making it more critical than ever for drivers and passengers to wear a seat belt. With more cars on the road, the chances of being involved in a crash go up, and a seat belt is the best defense. It is why during the Thanksgiving holiday, which runs from Nov. 22-26, the Montebello Police Department will be looking for drivers and passengers who are not wearing a seat belt. As a primary seat belt law state, California law enforcement can issue tickets to people who fail to wear a seat belt. Violations are punishable by a $162 fine. The Montebello Police Department is one of many agencies across the country participating in the national Click It or Ticket enforcement campaign aimed at saving lives by making sure all drivers and passengers get the message to buckle up. During the 2016 Thanksgiving weekend, 341 people were killed in crashes nationwide. Of those killed, 49 percent were not wearing a seat belt.